Donald Trump met with Russia’s foreign minister for the first time on Wednesday — and by the time the two men had stepped into the Oval Office, Sergey Lavrov had already pulled a fast one on our president. There were enough surreal details to the Trump-Lavrov meeting to fill the first few shots of a David Lynch film. Chief among these, of course, was the fact that the Russian minister’s visit came less than 24 hours after Trump fired the man leading an investigation into his campaign’s Russia ties. When asked about this odd timing, Lavrov feigned ignorance and shock at the Comey development. But even without Tuesday’s bombshell, Lavrov’s visit would have been strange. Since Putin’s invasion of Crimea, the Obama administration had refused to grant Lavrov a White House meeting. And just days before the foreign minister’s arrival, hackers with suspected ties to Russia attempted to interfere in France’s election. Typically, such an event would make an American administration think twice about granting the Kremlin its desired photo op. But Vladimir Putin had personally asked Trump to meet with Lavrov during a recent phone call, and the president decided to be obliging. Trump was similarly accommodating Wednesday morning, when he ushered a Russian photographer into the Oval Office for his meeting with Lavrov — even as he kept the crowd of American photojournalists locked outside. As it turned out, the White House was not discriminating on the basis of nationality, but merely profession — or, at least, that’s what it thought it was doing. The administration did not want any members of the news media to record and publicly disseminate images of the closed-door meeting. But the administration believed that Lavrov’s cameraman was an official state photographer — not a photojournalist. This proved to be a mistake. “We were not informed by the Russians that their official photographer was dual-hatted and would be releasing the photographs on the state news agency,” one administration official told the Washington Post. TRUMP: Let's nominate Sergey to replace Comey! LAVROV: You kill me, Donald. Another conveyed this information less diplomatically to CNN’s Jim Acosta. 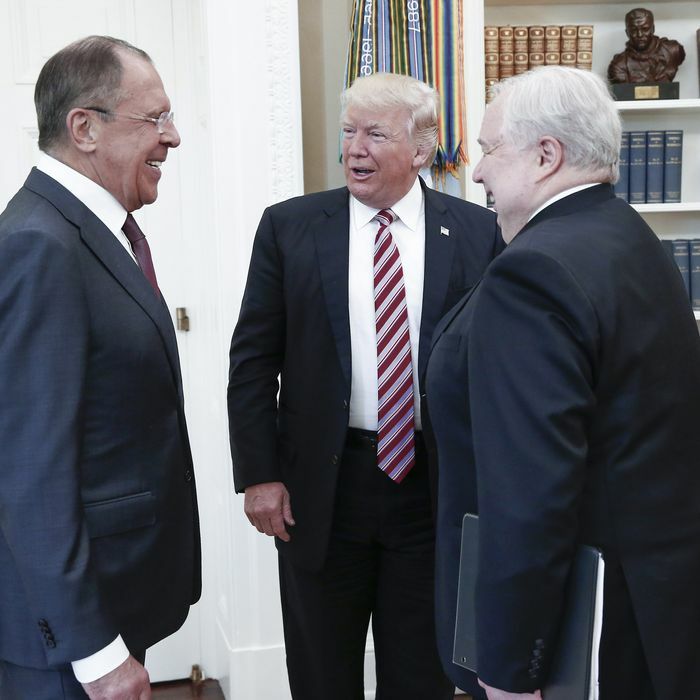 WH furious over Russian government photos of Trump meeting with Lavrov/Kislyak. "They tricked us," an official said of Russians "They lie." The administration was not eager for the public to see images of Trump getting chummy with Lavrov and ambassador Sergey Kislyak — the man whose conversation with Michael Flynn about the lifting of sanctions ultimately got the national security adviser fired. The officials cited the danger that a listening device or other surveillance equipment could have been brought into the Oval Office while hidden in cameras or other electronics … Among those commenting on the issue was former deputy CIA director David S. Cohen. Responding to a question posed online about whether it was a sound decision to allow the photographer into the Oval Office, Cohen replied on Twitter: “No it was not.” He declined to elaborate when reached by phone. The White House insists that the photographer’s equipment was subjected to a security screening and that the Oval Office is routinely swept for bugs. And that should dispel all concerns. After all, what cause do we have to question this administration’s competence?